This new series comes out of an Artist Residency at the Paul Gauguin Cultural Center, where I spent three months on a remote South Pacific island in the Marquises. 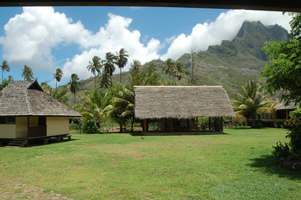 The island of Hiva Oa is where Artist Paul Gauguin painted and lived out the remainder of his life. On Hiva Oa, I became interested in the traditional roles both women and man had and how this was expressed through ornamentation. These roles are shifting, especially with the overlay of European culture present. The Marquises people are currently involved in an intense re-examination of their history. I did a switch of traditional gendered adornment and made ornaments for men with flowers and pieces for women utilizing the tattoo symbols of the warrior. I worked very big and free using simple materials. Over the past two years, I have been studying the objects and photos and writing to understand how this investigation might shape understanding of gender expectation in ornamentation. There has been much writing about the loss of distinct style linked to a place, but I am curious about why with all of our global contact, our ideas of what can be considered jewelry haven’t changed that much. The work in Jolie explores nontraditional adornment. It is big, bold, white, and mostly made for men.